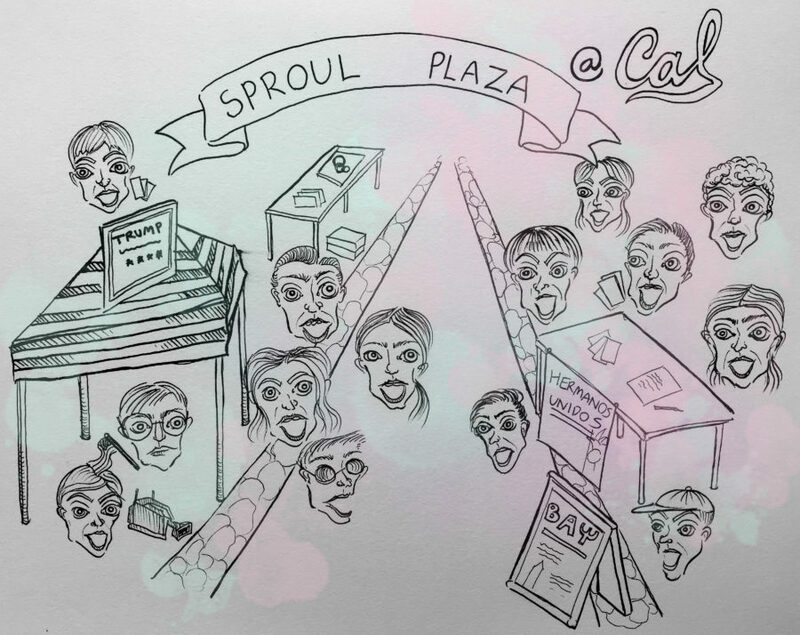 Walking down Sproul Plaza during my first week as a student, I could not believe that the most crowded booth belonged to the Berkeley College Republicans. Thoughts like, “How dare they display a Trump cardboard cutout?”, “Don’t they know he’s a laughing stock who would never win the presidency?” and “How could anyone possibly support a man like that?” raced through my head. In anger and disbelief, I questioned whether I should stop by and pick a fight. As I approached what I once perceived as enemy lines, it became clear to me that I was not the only enraged student; In fact, it seemed that dozens were in line for an opportunity to shut down their peers in whatever way possible — red-faced and yelling, climbing over each other and not letting others finish their sentences. This moment was when I began to understand where the “dirty liberal” stereotype I had been warned against comes from. It’s no secret that UC Berkeley has a reputation as an extremely liberal campus. When I committed to spending the most pivotal and defining years of my life here, my family worried that I would turn into even more of a leftist idealist than I already was. And it’s true to a certain extent– this campus has changed me. Friends back home roll their eyes when I say that after a semester here, I became vegetarian, joined Amnesty International and picked up an Ethics concentration in my major. But contrary to popular belief, I have not become a violent anti-fascist, a member of the socialist party or a dissenter of free speech. Shockingly, I’ve actually become more open to opposing viewpoints than I had ever been before. It seems like an obvious truth that the world’s spectrum of opinions cannot be sorted into segmented categories of right and wrong. Unfortunately, most of us do not tend to consider this notion when engaging in conversations with those who disagree with us. Our opinions make sense to us, so of course we think they are correct; but if we take a step back to think about how we acquired them in the first place, we will realize just how arbitrarily our minds really work. All this goes to show that it makes little sense to vehemently blame others for simply thinking a certain way. If we grew up like they did, were exposed to similar experiences and read the same news sources, who’s to say we wouldn’t believe in those ideals too? We college students are in the unique phase of our lives where our main purpose is acquiring more knowledge and shaping our worldviews; we would be doing ourselves a disservice by shutting out controversial viewpoints. At UC Berkeley in particular, lack of dialogue between disparate views has led to a myriad of issues among the student body and the administration. Perhaps instead of dismissing the other side as “crazy” or accusing them of disseminating “fake news,” we should seek to thoroughly evaluate our beliefs and listen to every perspective in order to make the most educated choices. One way of doing this is to actively seek out evidence that would challenge our views, such as established political sources that we disagree with. Including both liberal and conservative leaning news sources could be a worthwhile pursuit, as could attending meetings hosted by controversial groups on campus. Another method is to alter the way we approach our conversations. Instead of debating with the goal of proving someone wrong, we could enter discussions with the intention of collaboratively seeking the truth. If we aggregate our own perspectives with differing viewpoints, we could more easily get to the bottom of what we believe, why we hold certain ideals so dear in the first place and the ways in which our differing values can translate into collective action. To those who disapprove of reaching out to the other side of the political aisle: No, I haven’t “given up.” I will continue to fight for human rights and liberal policies, and I will work hard to elect a Democratic president in 2020. I do not accept hateful rhetoric and discrimination as an institutional framework. I value marriage equality, a woman’s right to choose, environmental policy curbing human-caused climate change, common-sense gun control legislation, government intervention in wealth inequality and an America built on and open to immigrants. But I will listen. When I walk by the BCR table nowadays, I will talk to, compromise and work together with my peers who care just as deeply about the future of our nation as I do. As President Obama stated in his farewell address, “Politics is a battle of ideas; in the course of a healthy debate, we’ll prioritize different goals, and the different means of reaching them. But without some common baseline of facts; without a willingness to admit new information, and concede that your opponent is making a fair point, and that science and reason matter, we’ll keep talking past each other, making common ground and compromise impossible.” Here at the birthplace of the Free Speech Movement, we should take these words to heart as we navigate the difficult conversations we have every day. But of course, that’s just my opinion; feel free to disagree. Either way, let’s talk.